Did we REALLY go to the moon? Or was it all an elaborate hoax involving millions of highly trained technicians, the collusion of the world's largest governments and news media organizations, and scientists all over the Earth, somehow all dedicated to fooling the rest of us saps? Or was NASA's space program merely a sham, propped up to distract us from the REAL STORY of sinister super-constructions and Martian "alternative three" type bases designed to protect the rich and powerful from Earth's inevitable ecological destruction? OR did the Apollo landings discover TERRIFYING LIFE FORMS on the Moon that must be hidden from the public lest panic erupt? As always, COMIC BOOKS hold the answer. 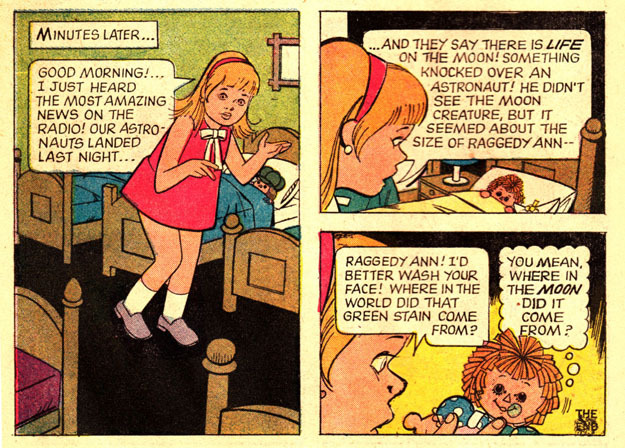 Comic books, that is, starring noted conspiracy researcher Raggedy Ann and her erstwhile compatriot Raggedy Andy. 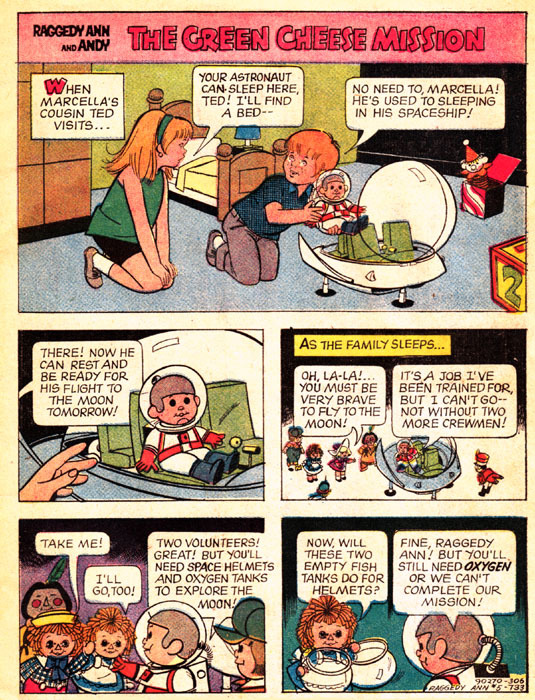 Together with Cutey Astronaut (from Kenner) they have amazing toy adventures while their cruel human masters slumber unawares. As to what happened to Marcella's scuba diver doll...well, let's just say many brave toy hearts are buried in the deep. And another NASA mission blasts off into the unknown! Hope they remembered to bring plenty of TANG, because we want it all as far away from us as possible. That stuff is nasty. In reality, the microgravity experienced during lunar insertion orbit manuvers will not hurl you violently from your seat, or expose your bloomers. 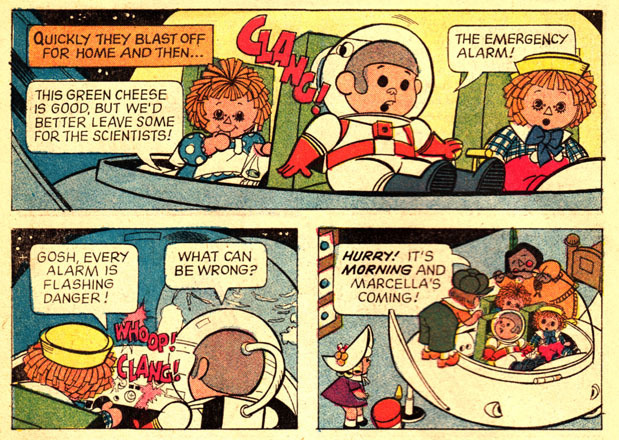 I'm shocked at the lack of basic physics knowledge on display here in this Raggedy Ann comic book. 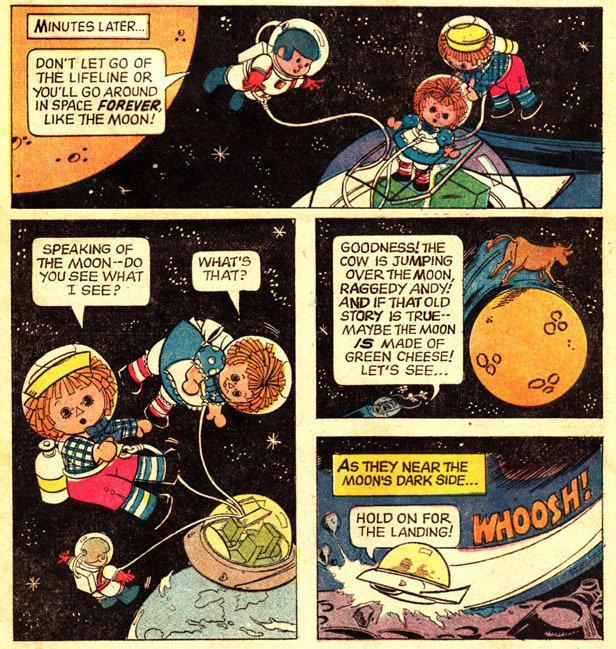 Raggedy Ann's sharp button eyes spot MOONIK THREE, Russia's 1964 attempt to put a cow in Lunar orbit. The third stage boosters failed and MOONIK was not able to achieve lunar orbit, instead hurtling into the void of deep space. Many brave cows gave their lives in the pursuit of space knowledge! 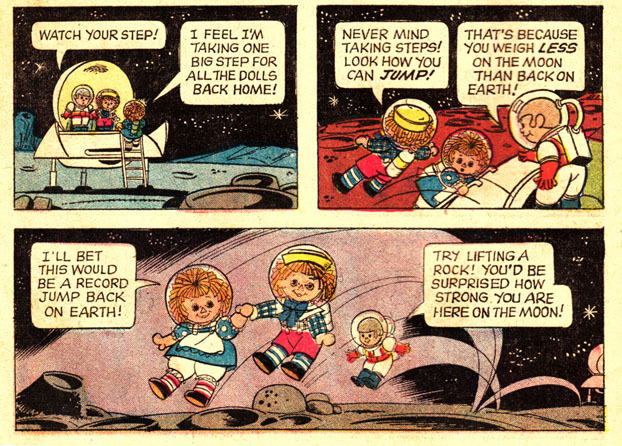 Seeing as how Raggedy Ann is a fabric doll made of cotton and yarn, I'd also be surprised at how strong she is on the moon, or Earth, or anywhere, really. A strong sense of scientific duty and attention to scheduling pays off as Cute Astronaut discovers whey-based foodstuffs on the lunar surface! Take THAT, Harrison Schmitt! "They mustn't see us out of the nursery!" Or on the Moon, or walking around anywhere, I should think. 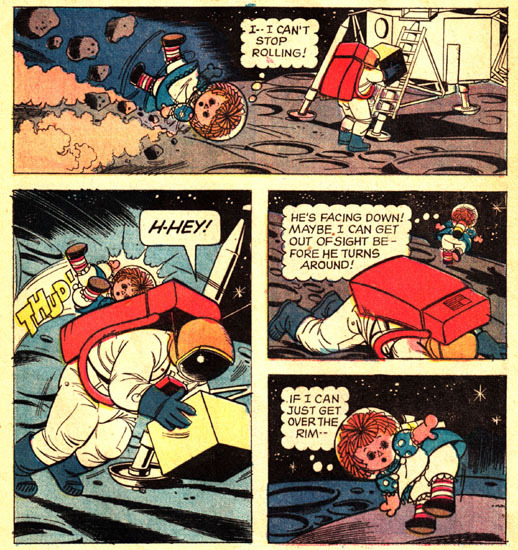 Unfortunately Raggedy Ann's mary janes aren't certified Moon-worthy and the full eight or nine ounces of her weight slams into the astronaut like eight or nine ounces of bricks. Will Apollo 16 Commander John Young discover the shocking truth that SOMEBODY ELSE IS ON THE MOON?? 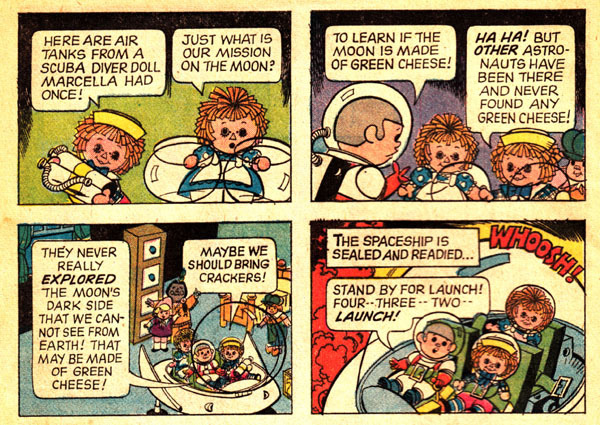 Luckily Raggedy Ann got behind the crater wall before our astronaut could right himself, check his life support systems, brush the ubiquitous lunar dust off his sleeve-mounted mission checklist, resume communication with Houston, and turn around. And it's just as well, we don't need any more astronauts coming back having been driven violently insane by the horrors of outer space. Wait, did I say "any MORE" astronauts? I've said too much. And so another successful lunar mission comes to a close. 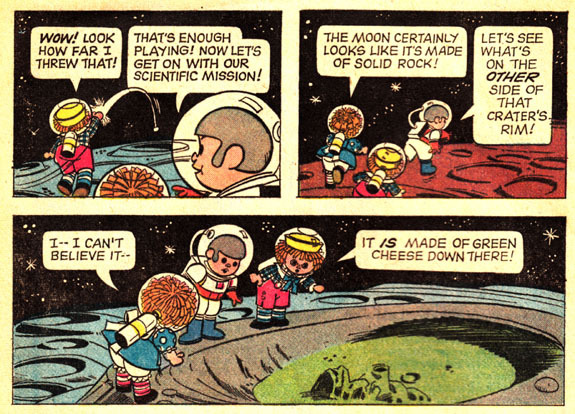 Will NASA ever reveal the truth about the green cheese on the far side of the moon? Or are they saving it all to spread on the "space crackers" of the privileged few? Write your congressman!